From May 2016 the Practice Incentive Program Digital Health Incentive replaces the Practice Incentive Program eHealth Incentive (ePIP), and includes new eligibility requirements. Every day one in five Australian GPs see a patient for whom they have no information. Shared Health Summaries provided by a patient’s nominated healthcare provider can assist other healthcare professionals to provide better care. The ePIP has been successful in encouraging the majority of general practices to become “My Health Record ready”; however this has not translated into active use of the system. 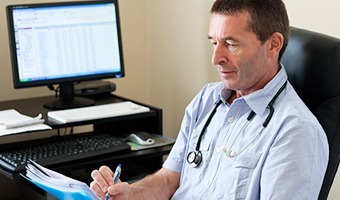 The new eligibility requirement is for general practices to contribute Shared Health Summaries to the My Health Record system for their patients. General practices will be required to upload Shared Health Summaries for a minimum of 0.5% of the practice’s standardised whole patient equivalent (SWPE) to be eligible for the Digital Health Incentive payment. All other Digital Health Practice Incentive Payment obligations and requirements remain the same. Updated online training materials and access to face-to-face training will assist general practices and GPs become familiar with and confident to use today’s My Health Record system. Contact your Primary Health Network for more information about the support that is available. The Digital Health Incentive, including the requirement to upload Shared Health Summaries, will commence from 1 May 2016. This timing is aligned with the reference period May–July for the August 2016 payment quarter. Formal, written notification about the new Digital Health Incentive requirements will be issued to general practices currently enrolled in PIP by the Department of Human Services. Future notifications will provide information on what practices need to do to participate in the Digital Health Incentive. Use a compliant clinical software system to access, retrieve and store verified Individual Healthcare Identifiers (IHI) for presenting patients. The practice must have a standards-compliant secure messaging capability to electronically transmit and receive clinical messages to and from other healthcare providers, use it where feasible, and have a written policy to encourage its use in place. Upload a shared health summary for a minimum of 0.5% of the practice’s standardised whole patient equivalent (SWPE) count of patients per PIP payment quarter.